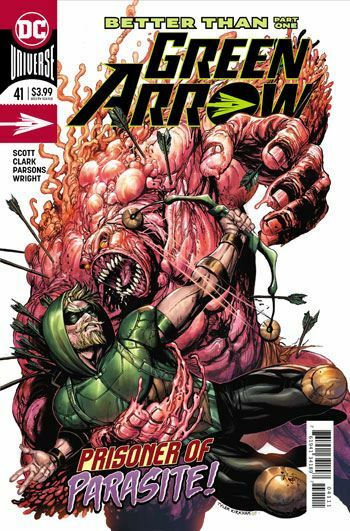 First off, the art on Green Arrow 41 is amazing. No two ways about it, Matthew Clark and Sean Parsons have executed an issue in which every single page is stunning. 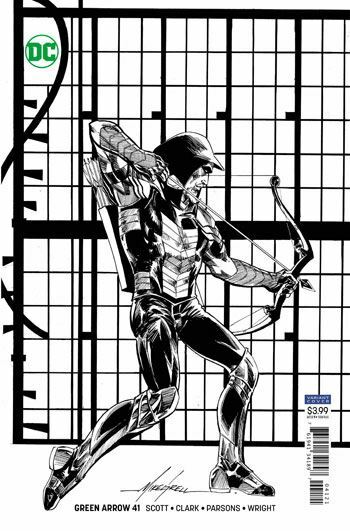 That’s an impressive feat, considering that Green Arrow spends most of the story in a maximum security prison, which does not lend itself naturally to beautiful rendering, and also because there is a massive amount of cameos, so many characters for them to illustrate. The story itself? Well, I am a bit on the fence about that. The problem I have, and I admit it’s not a huge one, is the cast of cameos is just a bit too large for the page count. We see Green Arrow facing off with so many different characters, but almost none of them get more than a panel or two of action. And a lot of these are major players, especially against a guy with a bow and arrow. I just wound up feeling like there was more potential here, and it got tossed away. Now it’s true that the story does not conclude in this issue, and the expanded role I desired for the many incarcerated villains could come in following issues. I would be more than happy to see that. But that is why I am on the fence. As much as I enjoyed this, I fear that the plot will centre on the Parasite, and leave everyone else out as it goes on. There is a logic to that, I will admit. The Parasite absorbs the powers of other characters, so he is basically loaded up like a buffet by the end of the tale. But I just don’t find the blobby Parasite as interesting to look at as the many other villains, and he generally lacks much motivation other than feeding. But what the heck, this issue looks so damn good that it is worth picking up, even if the following issues don’t pan out the way I would like.